When you look at population density in cities, there are two that are always at the top of the list. New York City has 27,781 people per square mile while San Francisco has 17,858. However, when you look at the whole metro area instead of just the city, the list becomes surprisingly different. New York drops down to 5,319 people per square mile putting it in fourth place and LA comes in a shocking first place with 6,999 people per square mile. The SF-Oakland Metro holds onto second place with 6,266 and perhaps even most surprising than LA is that San Jose creeps up to third place with 5,820 people per square mile. I never would have guessed. It's a fun factoid, but it doesn't change the reality on the ground. Seems more a reflection of the lack of density in the U.S. overall. Well I think its a fumction of how dense California suburbs are built, even though they're still completetly auto oriented. 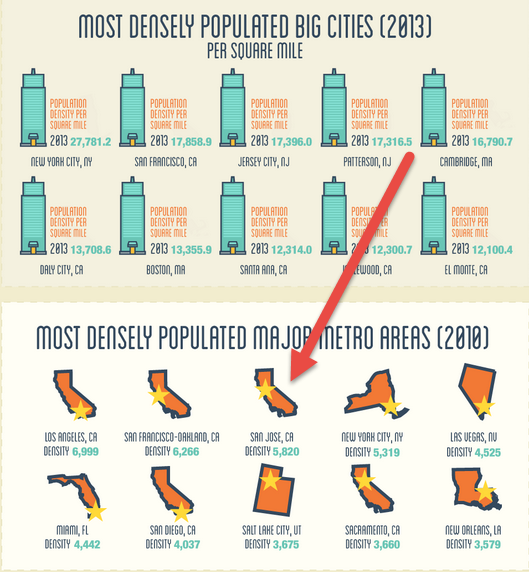 Daly City and Santa Ana are big cities?